Bondi Iceberg is a landmark of Bondi Beach for over 100 years. It is a popular rock swimming pool with restaurant and bar facilities upstairs that look over the entire beach. It is named for the brave swimmers who compete here in the winter months. You can enjoy some laps in the 50 metre Olympic pool or take the kids in the smaller kid's pool. Fully qualified lifeguards patrol the pools during opening hours. 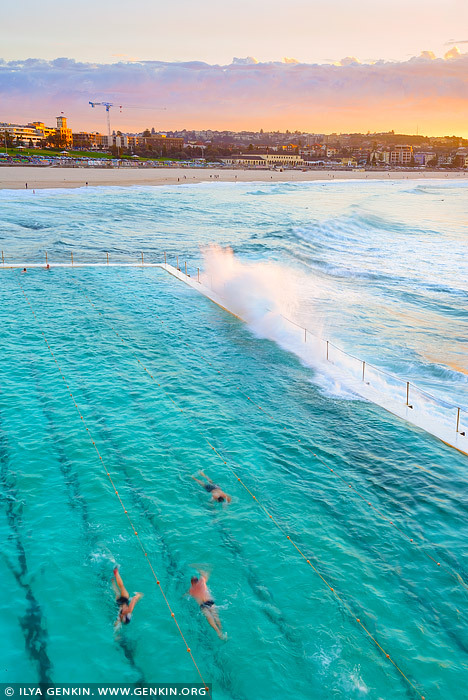 This is a a true Ocean Pool. This image belongs to the travel and nature stock photo library. This stock photo of Bondi Beach Icebergs at Sunrise is available for licensing for commercial and editorial uses including websites, blogs, books, magazines, brochures and advertising. Restrictions may apply for images which contain third party copyrighted material or sensitive subjects. Photos of artwork are for editorial use only. This image id AU-BONDI-BEACH-0002 of Bondi Beach Icebergs at Sunrise, is copyrighted © by Ilya Genkin. This is not a public domain image.